Golden Cherry Casino for US Players has All Roulette Varieties! Golden Cherry Casino for US Players has All Roulette Varieties! At Golden Cherry Casino, we understand the difference between the many roulette varieties, but we also know that might not be the case for all US players. Choosing a suitable game can be a befuddling experience. Just visit any site with multiple live rooms and you'll see the seemingly endless variety of games . Every month or so, a new idea comes along to confuse you even more. In an attempt to lure in slots players into roulette games, they now offer progressive jackpots on some sites. In reality, however, the basics will never change. There are basically three roulette varieties out there: American, European, and French. So what's the difference, you ask? Well, the answer lies in the little green slot on the wheel. Betting grids all look the same, but the odds of the ball landing in a numbered slot vary between the three versions. The circles have one green 'zero' slot. There are 36 numbered sections, and straight up bets (where you just bet on a single numeral) pay 35:1. The green aperture gives the casino their house edge. Without it, the expected taking from the table earned by the gaming hall would average out at zero, and there would be no point for them to run the table at all. Of all the roulette varieties, we at Golden Cherry Casino would recommend avoiding the American one, even for US players. While they pay the same odds, there are two green sections: the zero and a double zero. A hall running this is twice as likely to get a ball landed in the green, doubling the house edge. This is the main reason roulette is considerably more popular in Europe. The French version is played with a single zero wheel, but that doesn't make it the same as the European type. There's a small detail that lowers the house edge even further, which is why you should always try and find a French table if possible. When you make an outside wager and the ball lands in the green, half of your bet is returned to you. This is known as La Partage, and over thousands of spins, this will make a crucial difference in your returns. 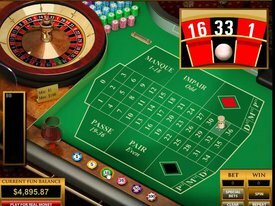 If you want to start playing today, then signup for a bonus to play roulette and other casino games.